When you look at the Punters Intel data from the Hawkesbury Guineas knowing Victorem hit the front you have to wonder how he was ever beaten. 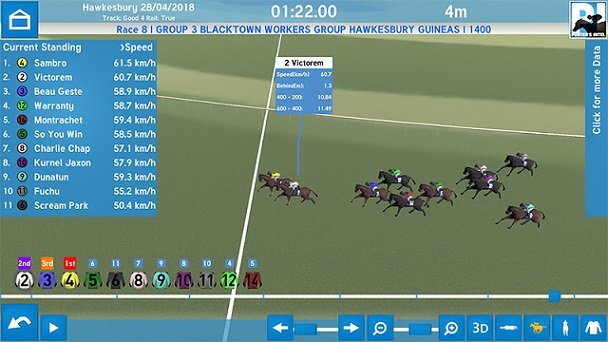 The Port Macquarie three-year-old produced a last 600m of 33.70, about 0.34 seconds faster than any other runner in the Group 3 race, yet was run down by Sambro. The difference arguably comes down to Victorem going right back to near last from the outside gate and having to circle the field while Sambro found a spot midfield or better, gained a split and was able to sprint that little better when it counted. Victorem covered an extra 14.6m in the run, 6m more than the winner. His 600m-400m was run in 11.49 and he zoomed the 400m-200m in 10.84, the fastest for that section on the day. But the final 200m proved crucial and Sambro ran 11.18 to Victorem’s 11.37. Take nothing away from the winner but Victorem has gone enormous in the Guineas. The Group 3 Dark Jewel Classic at Scone on May 12 is going to be a cracking race after a number of mares stuck their hands up at Hawkesbury. Godolphin Crown winner Pecans was first-up and she ran a solid 34.55 for her last 600m but there was plenty to like about the finishes of placegetters Ghisoni and Invincibella. Ghisoni loomed up to win, running 11.08 from the 400m-200m, then levelled out with 11.48 to the post while Invincibella ran 11.18 then home in 11.37 – the fastest final 200m of the race. In an earlier restricted event over the same distance, Siren’s Fury sizzled with a last 600m of 33.67, one of the fastest of the day, including 10.99 from the 400m-200m and 11.24 home. If she can replicate that sort of run at Scone she’s in the finish of that race. From the same race as Siren’s Fury, it’s worth mentioning fifth-placed Gaulois who, a bit like Victorem, had just too big a task. He was first-up as a gelding and settled at the tail, he went around them as opposed to the winner ducking underneath the pack, running home in 33.82 with a 10.88 from the 400m-200m and 11.51 to the post. The Hawkesbury Gold Cup (1600m) produced an interesting result going forward with Punters Intel showing five of the 11 runners broke 34 seconds for the last 600m but none of them finished in the placings. Mister Sea Wolf (9th, 33.65), Plaisir (7th, 33.66), Duca Valentinois (4th, 33.72), Destiny’s Kiss (10th, 33.96) and Articus (8th, 33.98) are the horses in question. Emerging stayer Roman Son is well worth a mention – he ran 35.36 for his last 600m which was half a second faster than any other runner in the 2100m event. He put the race away between the 400m and 200m with 11.37, showing a superior turn of foot. Most ground covered (to place): Victorem +14.6m. One horse to keep an eye on out of the Newcastle program on Saturday is Home Win, a Snitzel colt who was having his second start when he finished seemingly like he was shot out of a cannon from the home turn in a 1400m maiden. He spotted the leader, and runner-up, a decent start on the turn. From the 600m-400m he ran a fair 12.08, the second slowest for that split, then surged running the fastest final two splits of 11.54 and 11.77. The latter was 0.85 seconds quicker than the runner-up and his final 600m of 35.39 was 0.73 seconds faster than any other. Don’t miss Punters Intel with Gerard Middleton, Brad Davidson and Brad Gray on Sky Thoroughbred Central at 7pm on Tuesdays.